A 26-year-old man who has been paralyzed for five years was able to walk on his own again. How? By using his brain waves to directly control the muscles in his legs. The patient was able to walk a distance of approximately 12-feet using only a harness to help support his weight. 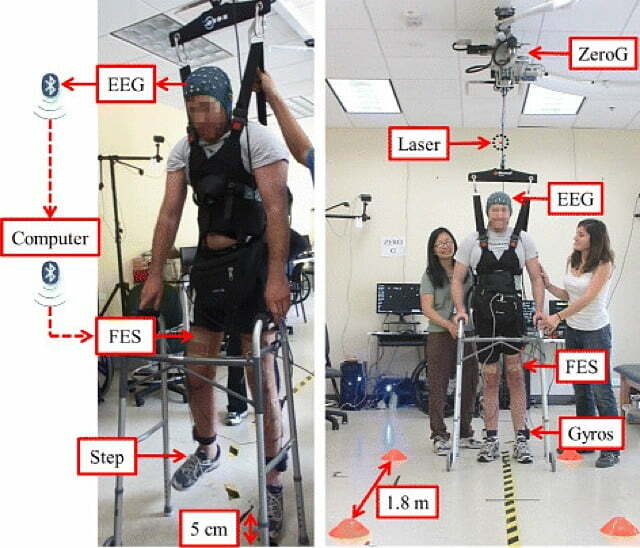 No exoskeleton or other assistive device was required for this ambulation, which was published recently in the Journal of NeuroEngineering and Rehabilitation. The brain-control system was created by a team of researchers at the University of California Irvine under the leadership of Dr. An Do, an assistant professor of neurology. The system required the patient to wear an electroencephalogram (EEG) cap that relayed electrical signals from the participant’s brain to electrodes attached to the muscles surrounding the knees. As the participant thought about walking, he produced brain waves strong enough to elicit a response in his legs. Prior to the experiment, the patient had to train his brain to control his legs by practicing with an avatar in a virtual reality environment. He also had to strengthen his leg muscles to support his weight and condition them for walking. During the post-training trials, the patent walked 3.66 meters using only a walker to maintain his balance and a harness to offset some of his weight. Using the brain to control paralyzed limbs has been used previously and is an established procedure. In earlier experiments, researchers have used similar brain control systems to move limb prostheses and, more recently, restore walking with the aid of an exoskeleton. This experiment further refines the brain-control system, allowing a patient to operate his or her legs with little to no outside assistance. “We showed that you can restore intuitive, brain-controlled walking after a complete spinal cord injury,” said Do. It follows a similar experiment by UCLA scientists in which a volunteer used brain control to power his leg muscles while using an exoskeleton for support.